We buy foreign coins for cash! If you have any unwanted foreign coins lying around don’t let them go to waste, collect them and send them to us and we’ll change them for you. UK banks do not change foreign coins for cash but we will! We buy foreign coins and send you payment in the form of direct electronic payment into your bank. We can also pay via PayPal as well as cheque if required. We exchange all coins such as Euros, Yen, Pesetas, Swiss Francs and Dollars – we even change old British and Irish coins. Why not take a look around your house now to see what foreign coins you have just sitting around and doing nothing? We can help you to turn this morning into money in the bank to spend on anything you like. It really could not be easier. Our coins for cash service is second to none and many of our customers get together with friends and relatives to collect foreign coins and then send us a bulk consignment. You may want to collect coins for cash for your local school, hospital or charity. It’s one of the best fundraising ideas around and very successful for charities. Why not start collecting foreign coins for cash today. 2. We sort and count the coins and e-mail you an offer to buy them. 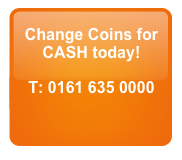 If you’d like to exchange your coins for cash then contact us today. We’d love to help you. We have helped countless customers to change their leftover currency and we could help you to do the same. Just look at what some of our customers are saying about us in our customer comments section. Whether you are a charity, a school, museum or hospital or you have just returned from a foreign holiday or business trip, we can help you to spend that money on something you really want or need. Exchange coins for cash the easy way with Cash4Coins. We are on hand to help with any amount of coins and if they weigh over 5KG we will arrange collection of them for FREE. And we’ll get a valuation to you as quickly as possible for you to consider at your leisure. There is absolutely no obligation but we think you will be nothing short of delighted with our valuation.